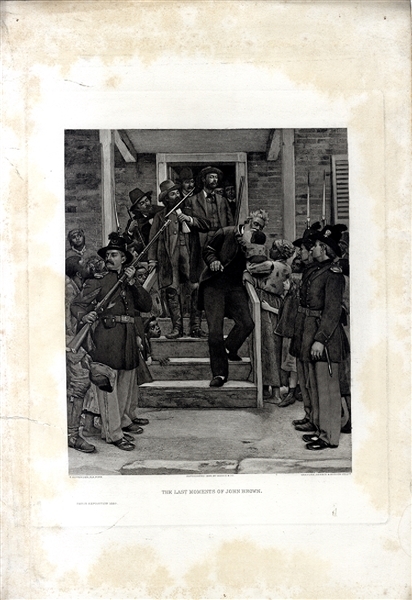 Gravure Print copyright by Gebbie and Co., 8” x 9-1/2”,, uncolored and depicts Brown leaving the jail house steps the morning of his execution, leaning over to kiss a black baby, 1” repairable margin tear, else VG. . The print is after the painting by the acclaimed nineteenth century artist, Thomas Hovende. John Brown, the radical abolitionist and architect of the October 1859 raid on the federal arsenal at Harpers Ferry, descends the stairs at the jailhouse in Charles Town, Virginia, on the way to his execution for treason, murder, and conspiracy. According to a New York Tribune article printed three days after his death, en route to the gallows Brown allegedly planted a kiss on the cheek of an enslaved child. Several works of art recorded the alleged scene over the following quarter century, culminating with Hovenden’s masterly painting, which was commissioned by Robbins Battell, a wealthy businessman from New York. The story of the kiss is almost certainly fictional, but just as the Tribune reporter in 1859 embellished his story to place Brown in a positive light, Hovenden and his patron in the 1880s sought to portray Brown as a sympathetic, kindly old man rather than as a violent criminal.Hovenden was commissioned by Mr. Robbins Battell to paint a historical picture of the abolitionist leader John Brown. He finished The Last Moments of John Brown (now in the collection of the Metropolitan Museum of Art) in 1884. Gift of Mr. and Mrs. Carl Stoeckel in 1897. Accession Number 97.5 Mrs. Stoeckel was Mr. Battell's daughter.